Where would we be today if companies like Apple, Amazon or Innocent hadn’t Jolted their industries by performing differently? Good is no longer good enough if you want to get ahead. To stand out from the crowd in business and in life, you need to shake things up. You need a Jolt! What could you achieve if you stood out from the crowd and got the leading edge in your profession? So is now the time to disrupt your thinking and transform your performance?! If every day looks much like the last, and your actions and those of the people around you seem to run on autopilot, you are missing out on the opportunity to achieve extraordinary results across your organisation. 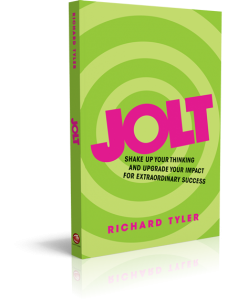 Richard Tyler will help you to discover all the answers you need and then Jolt you to put them into action. 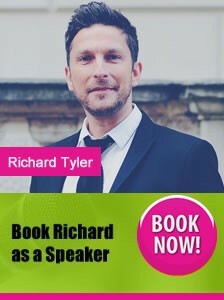 Whether through coaching jolts, leadership development jolts, cultural change jolts or conference keynote jolts, Richard will work with you to embed the learning. Not everyone is up for the challenge that Richard brings. If that’s you, that’s really alright because some people are just happy with ‘ok’….however, if you are flirting with the idea of being ‘extraordinary’, then it’s time to embrace the challenge now.